I was against The Pig at first. This was partly because my otherwise sane and wonderful husband purchased the half-pig from his friend and told me only after the fact. Before The Pig, we really only ate pork tenderloins, with a rare foray into bacon. But then we sampled The Pig. (Note it has now acquired capital letter status.) The meat was tender and flavorful without the slightest gaminess. Everything we’ve made so far has been delicious, and as for the bacon, there are no words. The latest entry in the pork sweepstakes was a roast. This lived up to our expectations: it was a fairly lean hunk of meat, bone in, with a layer of fat. And it was huge. I opted for a neutral flavor profile, since we clearly would be eating leftovers for quite some time. I was busy all day, so the slow cooker was the best option, but there’s no reason you couldn’t do this in a stockpot over low heat (or in the oven) for 2 to 3 hours. I loaded up the bottom of the slow cooker with aromatics — wedges of onion, chunks of celery, minced garlic, fresh parsley. I seasoned the roast with a serious dose of salt and pepper, then browned the heck out of it. I wedged the roast (did I mention it was huge?) on top of the veg in the slow cooker, then deglazed the browning pan with wine and stock. That golden liquid went over the pork, on went the lid, then I went on my merry way. Which means, in this case, that I watched football with my family (go Packers! ), then went to the movies with my friend Paula. Which was just as well, because the aroma from that braising pork was so enticing, it was all I could do not to yank off the cover and dive right in. When I got home, Tom had started some baby red potatoes on the stove. I tossed some pencil-thin asparagus (totally out of season, but irresistibly lovely) in the steamer, and pulled the roast out of the cooker. It was a challenge to get it out in one piece; it was so tender it wanted to fall into shreds. I strained the cooking liquid into my trusty fat separator. While that tool did its magic, I melted a bit of butter in a small saucepan and whisked in some flour. I stirred in the defatted liquid, then mashed in some of the strained veg. A quick whir of the stick blender made for a smooth, velvety sauce. While I was preparing the side dishes, we kept stealing shreds of the pork to nibble on. Cut the celery stalks in half and put them on the bottom of a slow cooker with the onion quarters, smashed garlic, whole stalks of parsley, and the bay leaves. Pat the pork roast dry. Sprinkle liberally on all sides with salt and pepper, and the herbal seasoning. Heat the olive oil to nearly smoking over high heat in a large skillet. Add the pork and brown well on all sides, about 4-5 minutes per side. 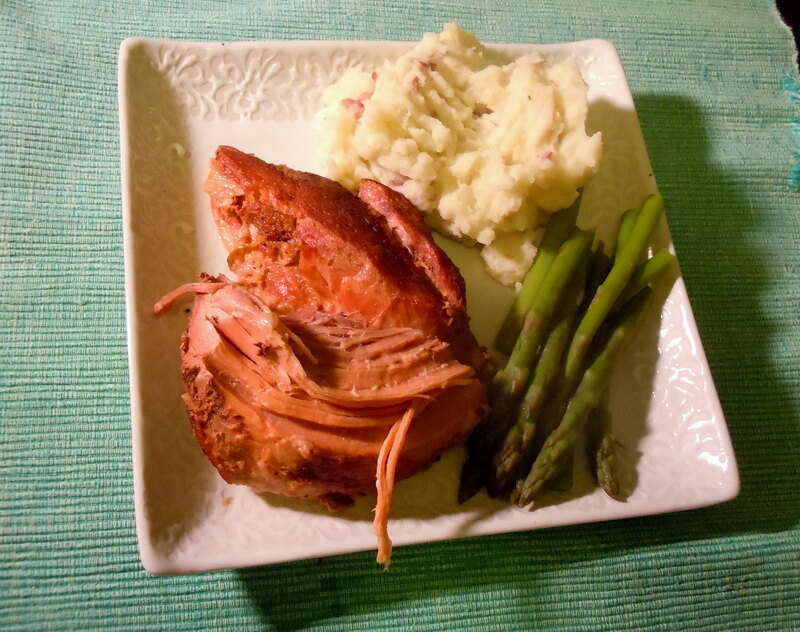 When it’s well browned all over, place the pork on top of the veggies in the slow cooker. Add the wine to the skillet and stir to scrape up all the browned bits. Pour over the pork. Add the stock to the skillet, stir to get up any leftover bits and to heat the stock, and pour that over the pork. 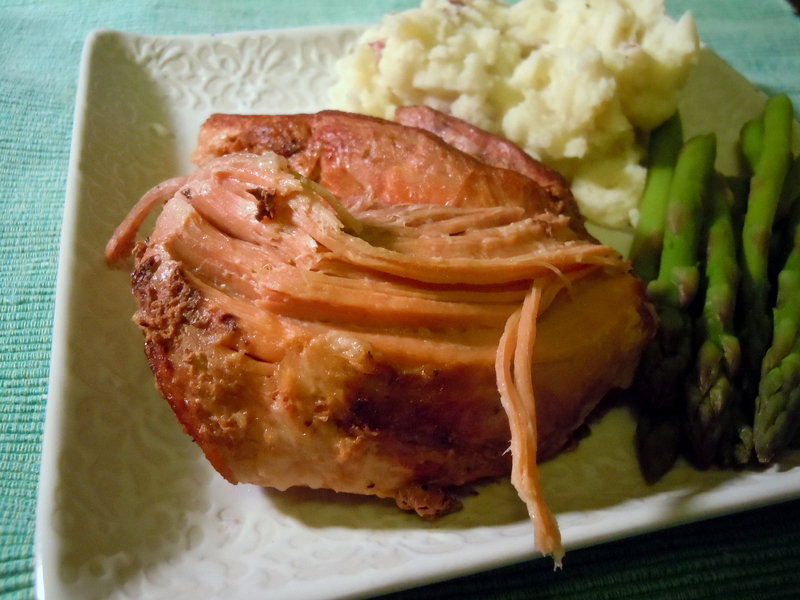 Cover the stockpot and cook for 4-6 hours on high or 8-10 hours on low, until the pork is falling-apart tender. Or you can brown the roast in a Dutch oven, add the veg and liquids, cover, and cook in a 325-degree oven for 2-3 hours until the pork is falling-apart tender. Transfer the meat to a serving dish and cover with foil. Strain the cooking liquid into a bowl or (if you have one) a fat separator. Let it sit for 10 minutes, then skim off the fat. Save the strained solids. Heat the butter in a saucepan over medium heat. Stir the flour into the melted butter and cook for a minute. Whisk in the defatted liquid. Add some of the onions, garlic and celery from the strainer; puree them into the sauce with a stick blender. Cook on high for a few minutes until the sauce is flavorful and thickened to your liking. Serve the sauce alongside the pork. This entry was posted in main courses, meat, poultry,and fish and tagged braise, pork, roast. Bookmark the permalink.